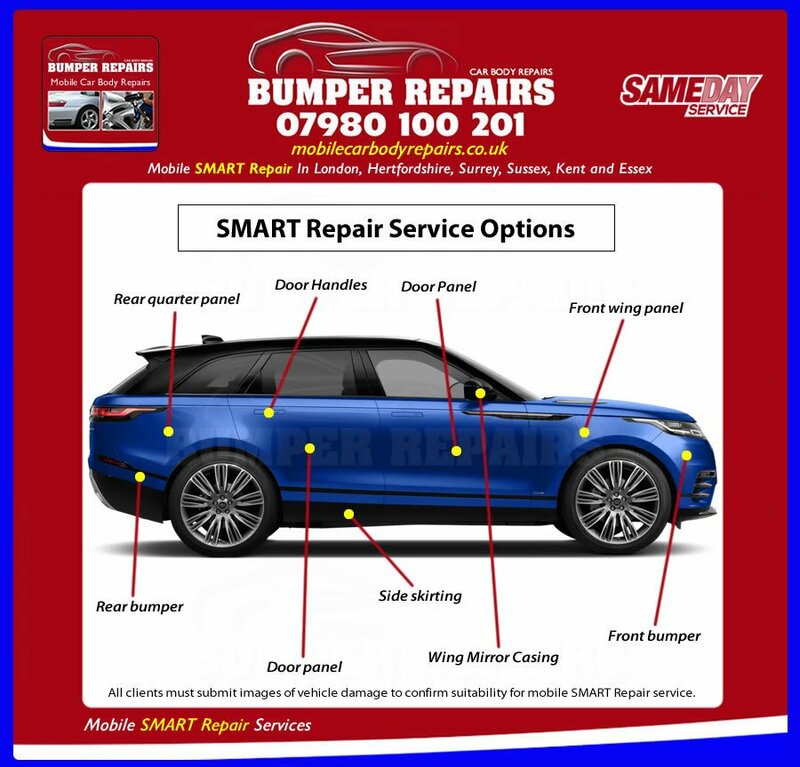 Our specialist mobile car body repairs are available to clients located in London, Hertfordshire, Essex, Surrey, Kent & Sussex who are in need of professional car body repair services to repair collision damage on vehicles and surface scratches on alloy wheels. Our mobile car body repairs, generally work out cheaper than traditional body shops or accident repair centres and our highly skilled mobile vehicle technicians can attend your home or place of work to repair your vehicle damage. Typically a mobile SMART Repair service is a mobile version of a traditonal car body shop and because tools and any needed machinery are portable and compact, mobile vehicle technicians have the ability to complete a wide range of car body repairs from customised light goods vehicles, where the service is designed to repair cosmetic vehicle accident damage, as opposed to major crash repairs. The materials and equipment used by our mobile vehicle technicians are specific to these types of car body repairs where heavy lifting or larger pieces of equipment are not employed whilst still allowing the repair of bumper scratch repairs, panel scratch repairs, car dent removal, cracked plastic bumper repair, alloy wheel repairs, stone chip repairs and light scratch repairs.